Garmisch-Partenkirchen, Germany – Saturday’s race was the official Audi FIS Ski World Cup downhill day in Garmisch, as Friday’s race was a makeup race from Wengen. 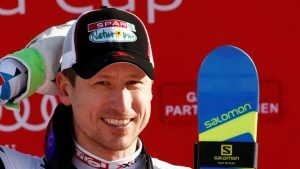 Austrian skier Hannes Reichelt was untouchable with bib #1 in the final downhill before the World Championships in St. Moritz kicks off in February, taking the win. Peter Fill of Italy was second and Beat Feuz of Switzerland third. A back surgery in late summer prevented Reichelt, the defending Super G World Champion, to start the season at his best, but he claimed his first top-10 of the season in Val Gardena, and took second place in the Santa Caterina super G. The 36 year-old Austrian finished just off the podium on Friday in fourth place, despite a big mistake in the upper part of the course. While Travis Ganong, of Squaw Valley, Calif. won in Friday’s attempt, he skied the rough and bumpy course to finish just outside of the top 10 in 12th on Saturday. The rest of the American Downhillers finished in the points, with Bryce Bennett (Squaw Valley, Calif.) 22nd, Jared Goldberg (Holladay, Utah) 26th, Tommy Biesemeyer (Keene, N.Y.) 27th and Andrew Weibrecht (Lake Placid, N.Y.) 28th.